We have a 5-3-5 decline so far in the cash index from a topping structure (Chart 1). 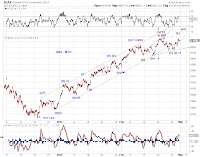 There appears to be less conviction by the bulls for the first time going into the close, evidenced by less vigorous short covering and heavy volume liquidation in the first few minutes of after-hour trading (Chart 2). Overnight action going into the first day of March is likely to be interesting. We have five wave down from the high. Let's see where it leads. 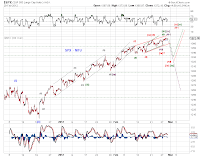 The wave structure in cash SPX appears (at least near term) terminal (Chart 1 and Chart 2), which that in ES can still be counted as a five-down and three-up retrace (Chart 3 to the right) with the AM high still intact. Furthermore, there's the suspense ahead of ECB's LTRO. We shall find out overnight. 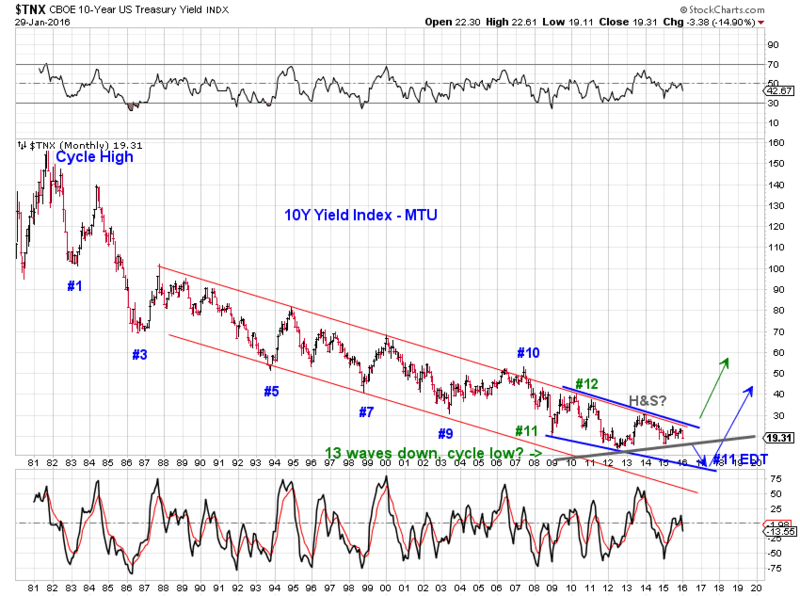 topping with respect to at least the Dec low. 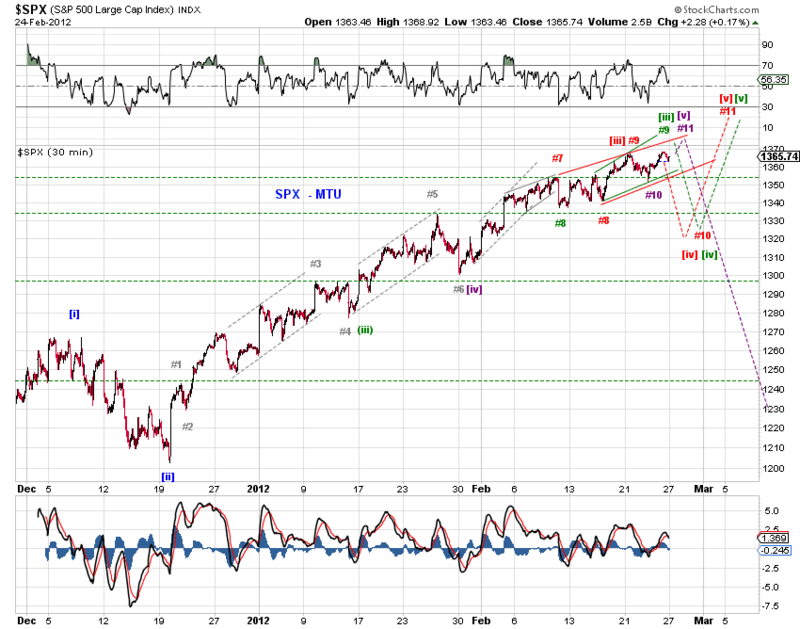 SPX completed a potential five-wave advance from this morning's low. Moreover, the proposed 4th wave is likely a triangle (Chart 1). This makes today's low a line in the sand for the near term. Chart 2 updates the larger count, still aiming for the green point 9 and purple point 11. See Rolling Over (2/24/12) for details. ES back testing near term broken channel. 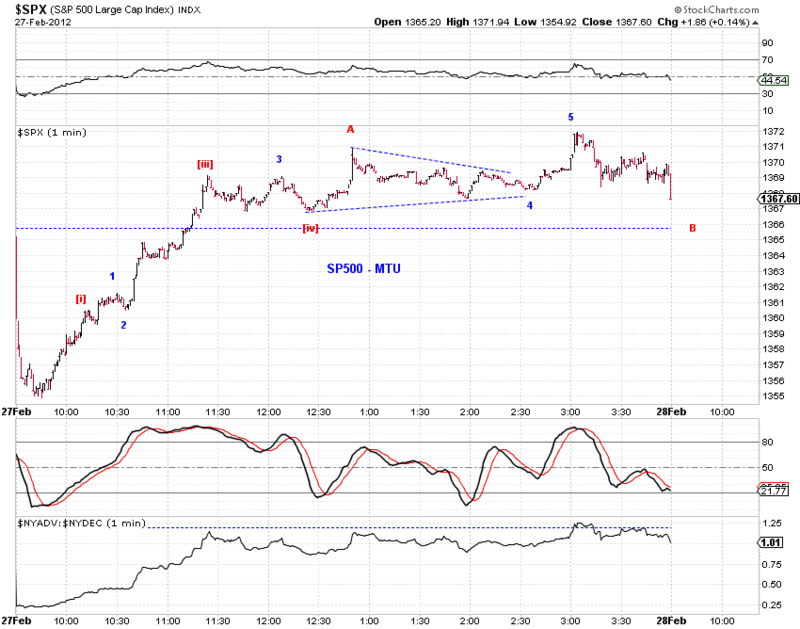 Chart 2 shows an imperfect but acceptable bearish setup with defined risk/reward. As the market got sandwiched between a newly minted bailout package for Greece and ECB’s LTRO next week, SP500 managed to climb “only” 0.33% this past week. Risks continue to be priced out by stocks as option premia dwindled. 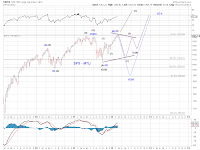 Odds favor the stock market to roll over, sooner than later. 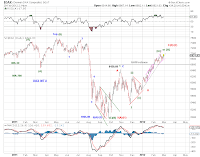 Sections - (a) near term outlook, (b) long term options for the hope rally, (c) funda"mental"s.
An impulse wave advance since the December 2011 low (and probably since the November 2011 low) is ending based on wave structure and time considerations. 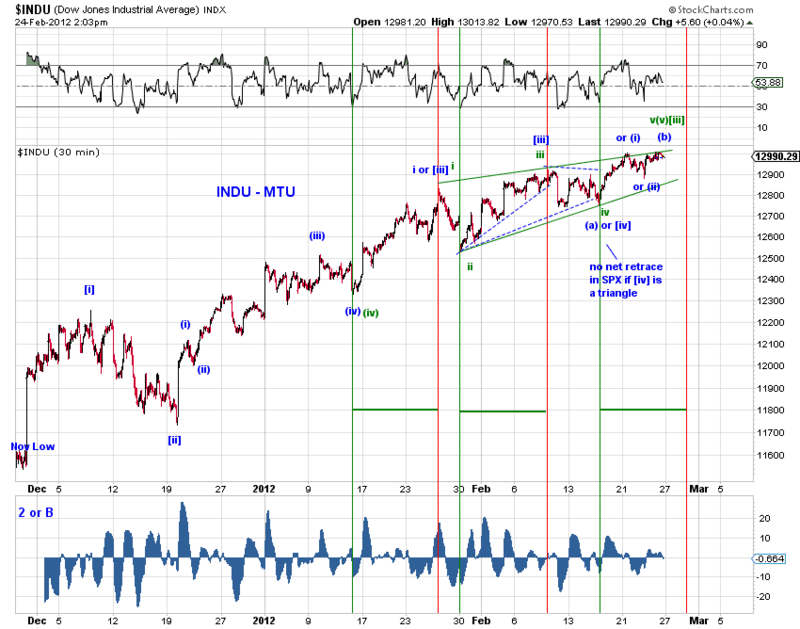 Chart 1 shows the most probable counts on INDU. 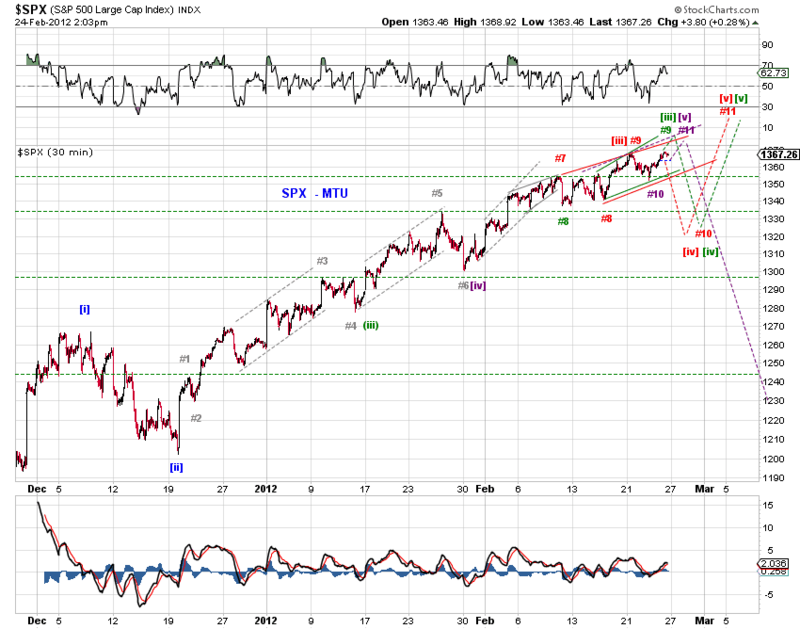 The blue count shows the market at the very late stages of wave [iii]-up since the November low where (v)-up of [iii]-up is an extended EDT. The red count shows the market wrapping up a five-wave advance since the November low, where wave [iv]-down ended on Jan 30th and wave [v]-up is a regular five. In either case, the minimum requirement has been met based on the higher highs this past week. 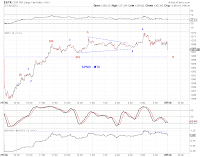 Chart 2 tackles the recent wave structure from a different angle. 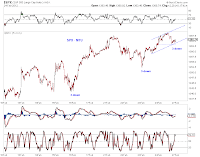 It counts the number of five-wave advances since the December 2011 low and highlights their channeling characteristics. The options are clear. 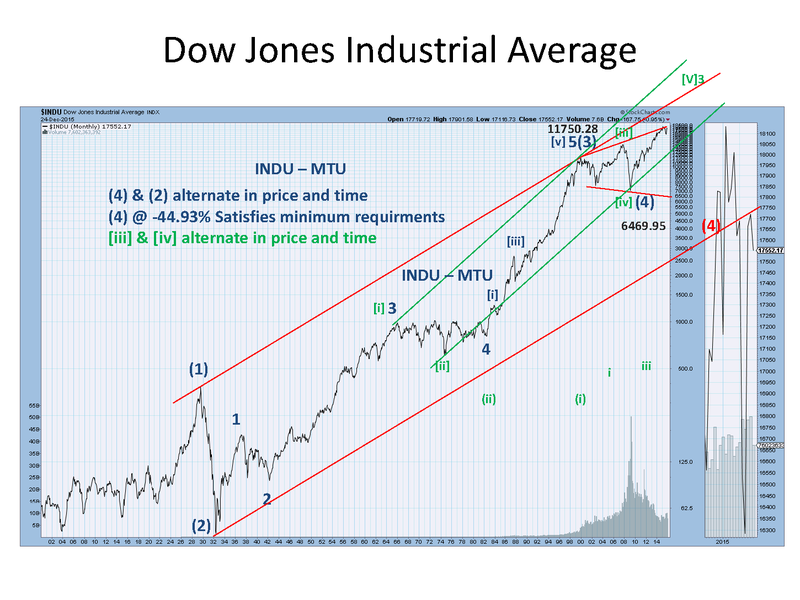 (a) The market is at the green wave number 9, which is logically wave [iii]-up from the November 2011 low. 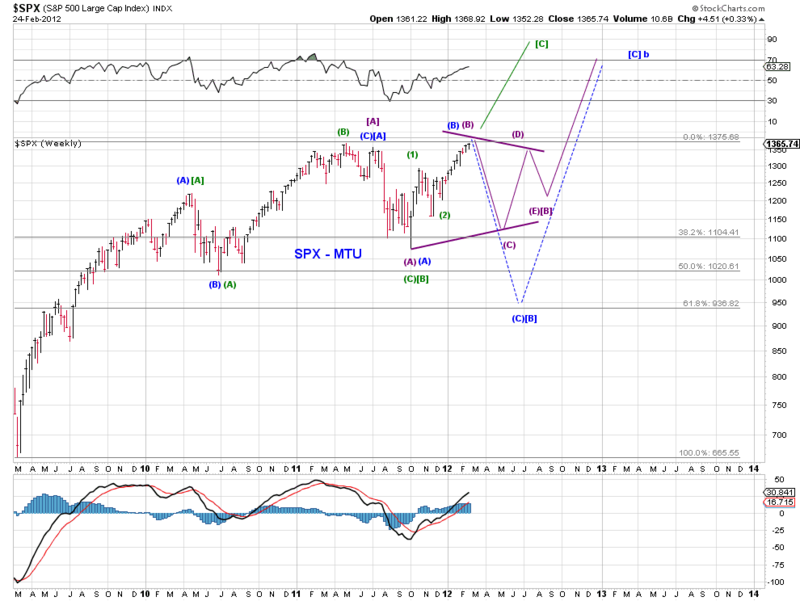 (b) The market is at the purple wave number 11, which is logically wave [v]-up from the November 2011 low. 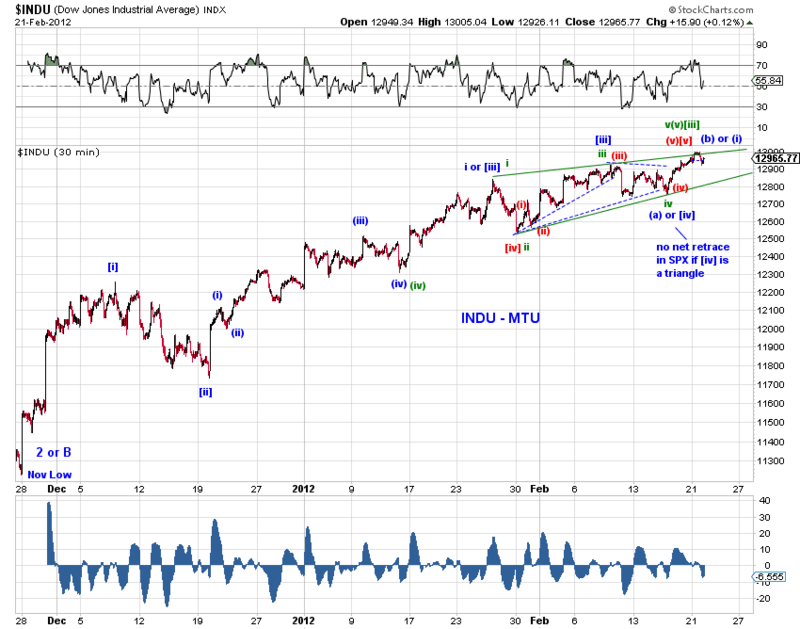 Note that options (a) and (b) coincide with the traditional wave counts on INDU as outlined in Chart 1. 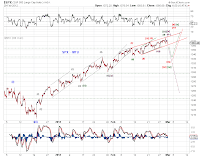 (c) The red wave number 10 could be in progress, which is logically wave [iv]-down from the November 2011 low. Wave [iv]-down is tracing out a triangle or an expanded flat. With respect to the near term, one notes from Chart 1 (INDU) that each leg of the proposed blue EDT wave (v) of [iii]-up is roughly of equal duration. 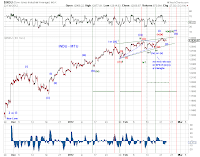 This puts a turn date sometime this coming week - see the red vertical turn lines in Chart 1. 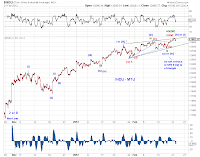 With respect to longer term prospects, we have mentioned in recent weeks that the first three phases of this Hope Rally appear to follow an interesting fib time relationship (see Turn Window (2/17/12)) . The next turn window straddles an early March turn date which is about one week away. 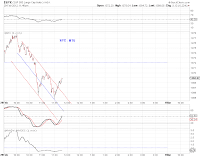 Chart 3 refreshes. 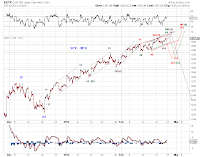 In addition to a potential triple-three structure for the Hope Rally highlighted in Chart 3, it's prudent to track a few more (Chart 4). As many seasoned wavers know, it's the probabilistic rather than the predictive characteristics that count - a map of potential paths beyond the horizon. 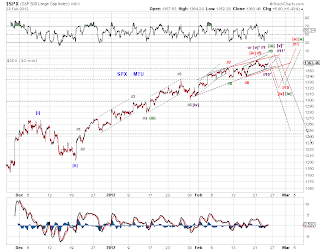 (purple) - A large sideways triangle dating back to early 2011. 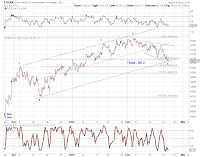 The market is wrapping up wave (B)-up. 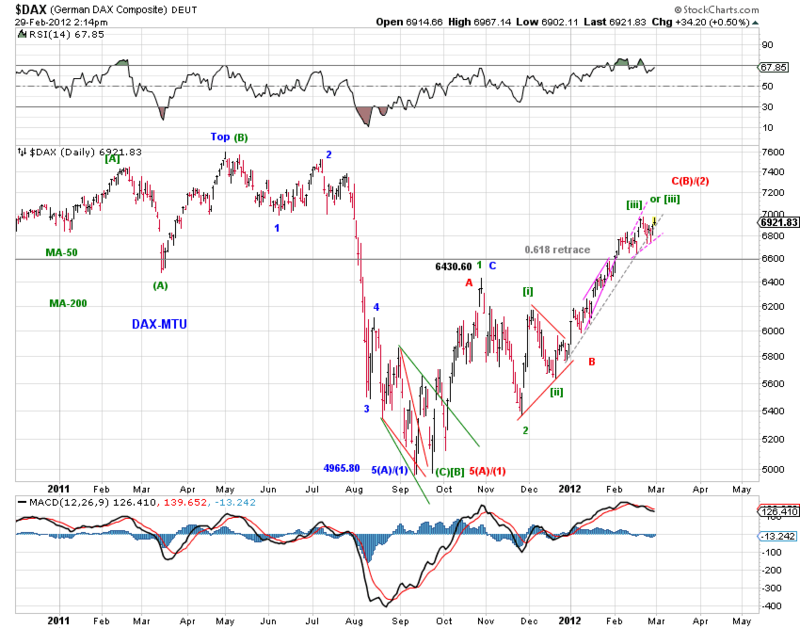 Wave (C)-down, (D)-up and (E)-down should follow to complete the stagnation around an election-year. 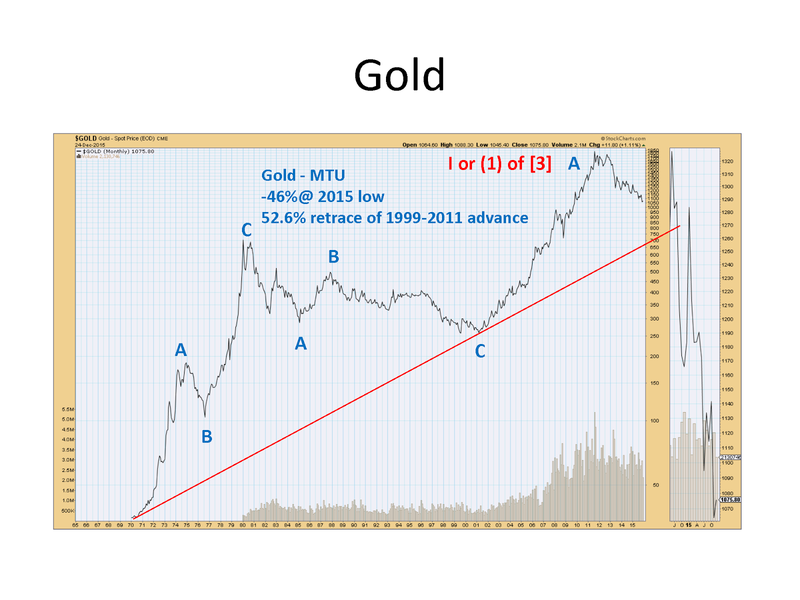 But the 2011 low holds. (blue) - An expanded flat dating back to early 2011. 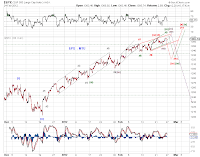 The market is wrapping up wave (B)-up. 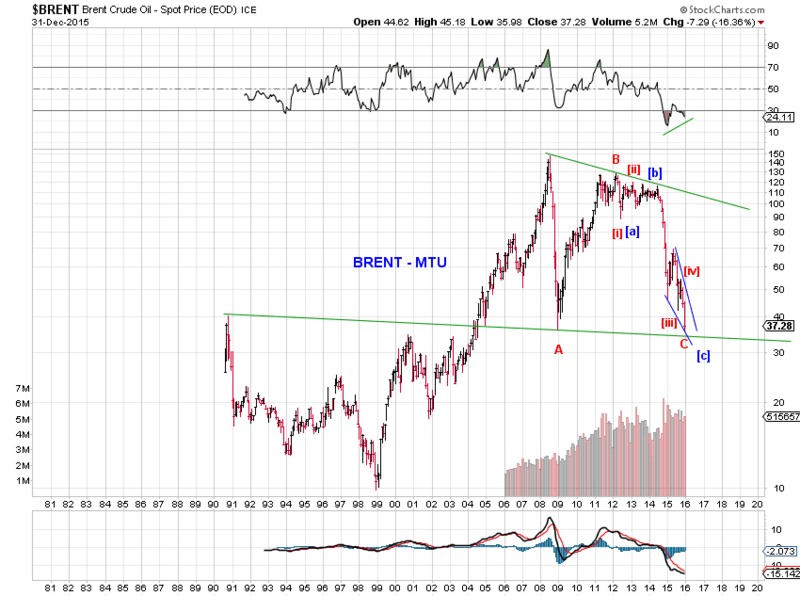 Wave (C)-down will breach the 2011 low. 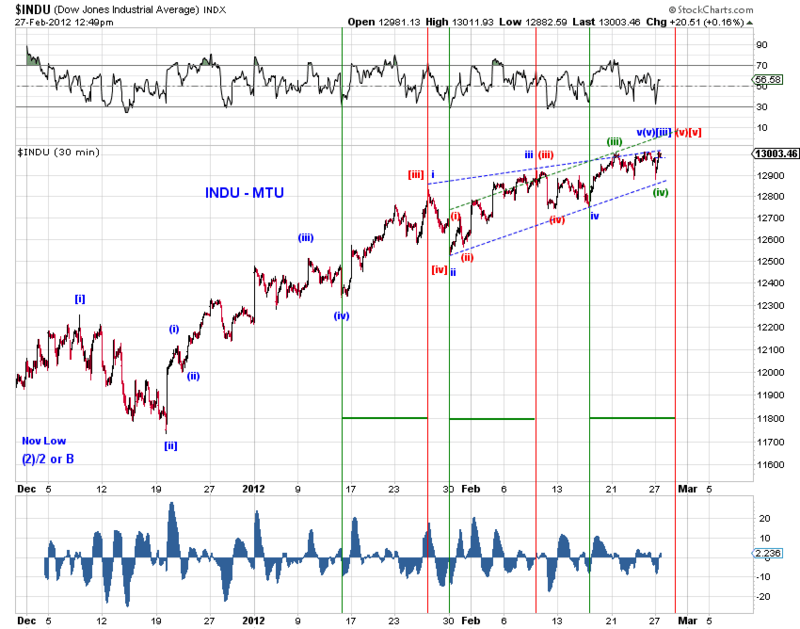 (green) - The 2011 low completed a long and odd running flat correction. 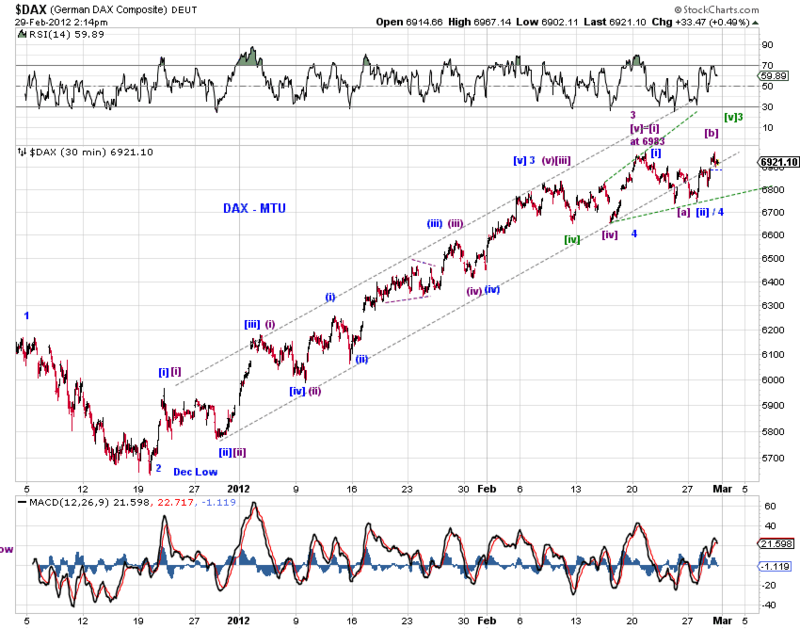 The market is in the early to middle stages of wave [C]-up. 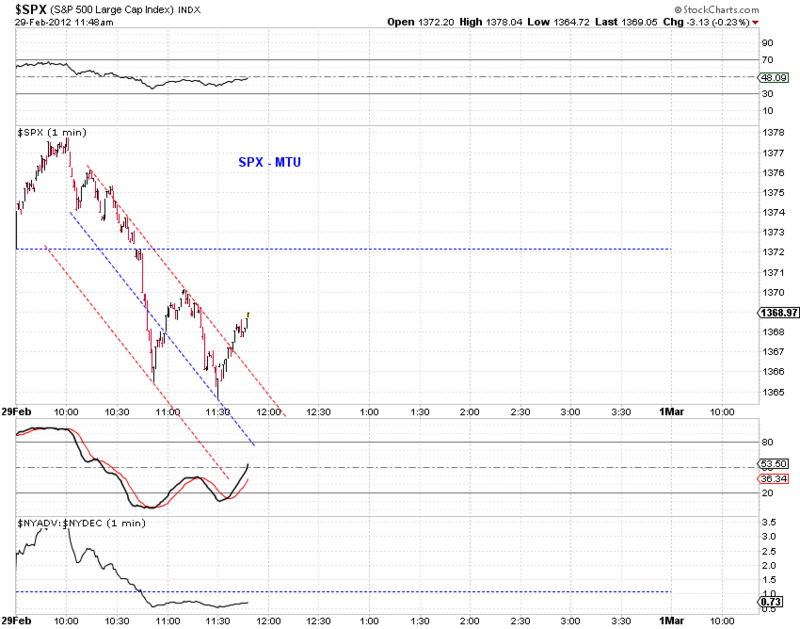 Expect pullbacks, but shallow to moderate ones only. 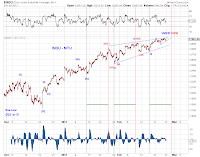 Perhaps the most uncertain and certainly the most debated aspect of this Hope Rally is whether it is the beginning of a new bull market or just a large upward correction. 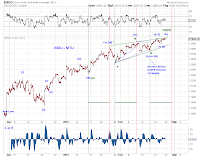 The practical implication on the stock market is the uncertainty surrounding (1) whether the rally has legs or (2) whether we have a sideways range at best or (3) a eventual collapse beyond the 2008/2009 low. As discussed above, there are likely no definitive answers, only probable "maps". Let's take a look at one of the "maps" - how the economic recovery accompanying the Hope Rally fares with the historical norm (Chart 5). We use BEA's reported GDP numbers as a reasonable proxy for the recovery. Despite measurement errors and other imperfections, GDP numbers likely put corporate-earnings prospects into perspective, especially in aggregate terms and in terms of longer term trends. As Chart 5 shows, the Hope Rally recovery severely lags past cycle average and the gap is only widening. Furthermore, economic output has just barely reclaimed its pre-crisis peak and it took much longer this time than before. While the market tends to be forward-looking and monetary policies around the world have been desperately accommodating, there's a limit to visibility and to hope. 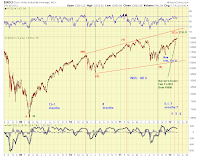 The clock is ticking before the next cyclical downturn knocks on the door. Still a three down from the high so far. 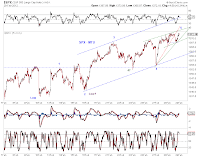 A follow up on the EOD updates on Feb 23 (SPX) and Feb 22 (INDU). The discussed options continue to track. 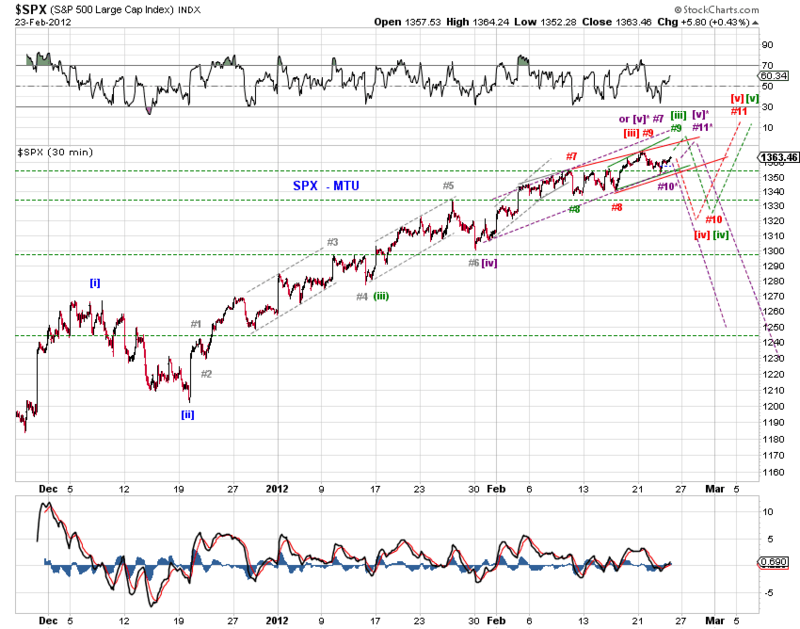 SPX is now well on its way to wrap up green #9 (moderate pullback or consolidationg to follow) and purple #11 (major pullback to follow). 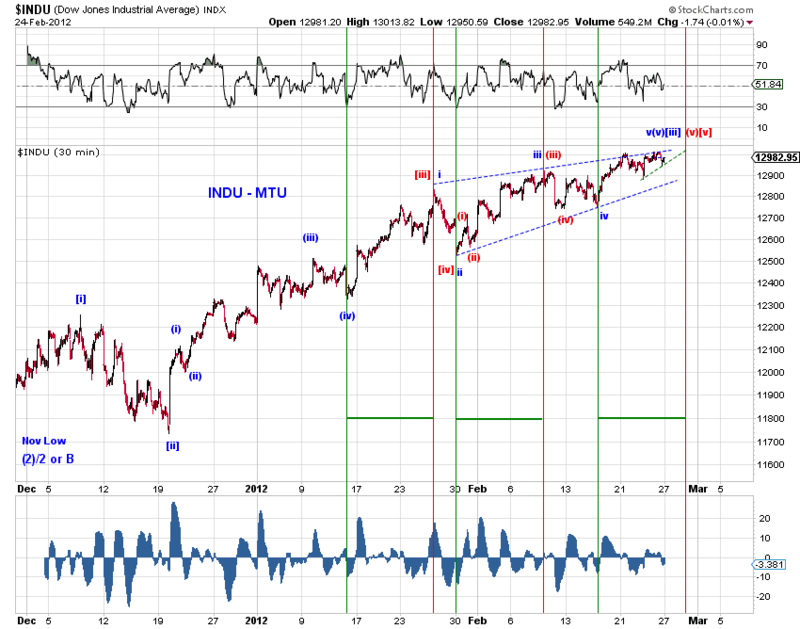 INDU is now well on its way to wrap up green [iii]-up or blue (b)-up of [iv]-down. 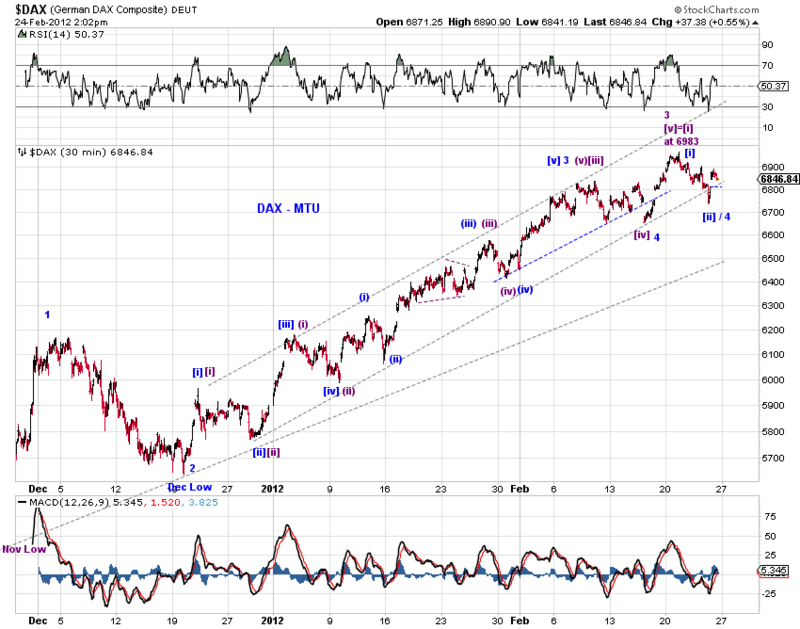 DAX and ES topping. 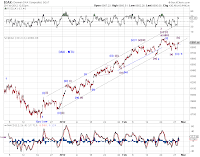 See detailed counts in charts. 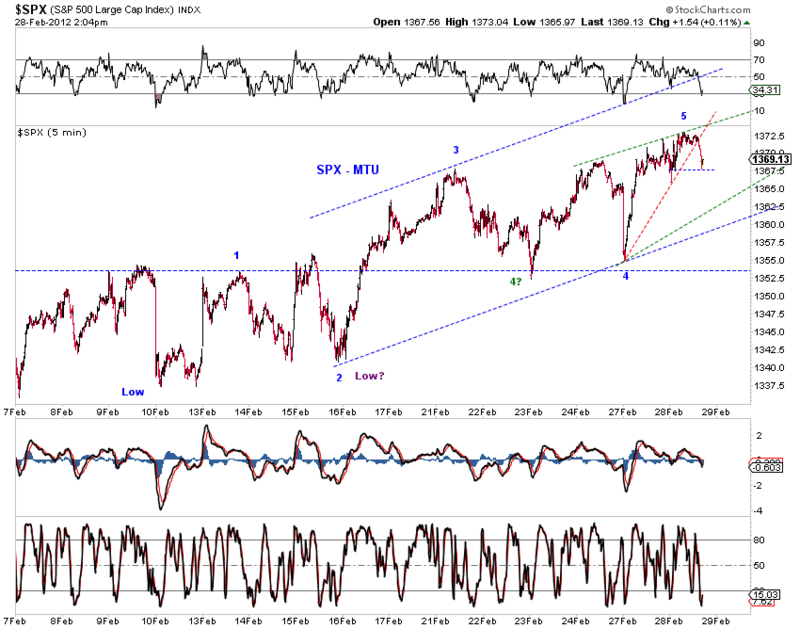 These counts put SPX at a topping area either from the Dec low or from the Nov low. 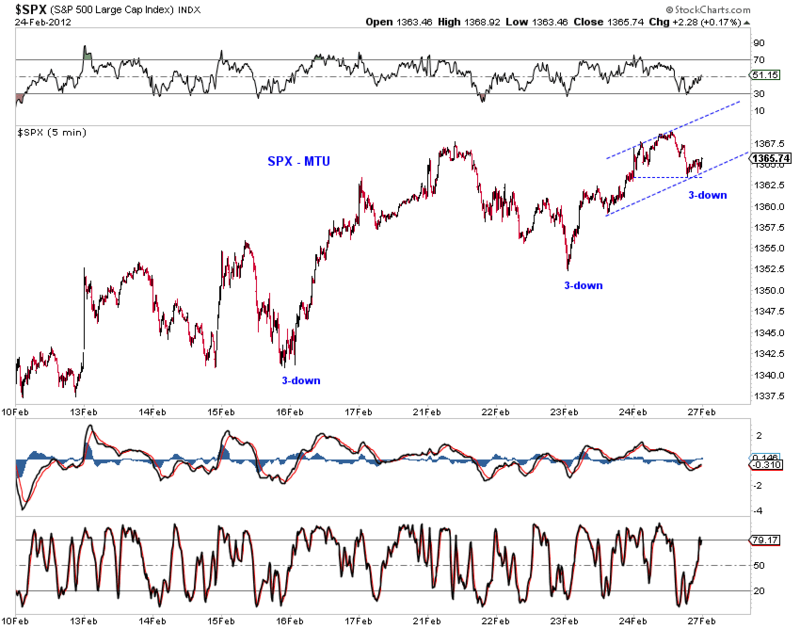 An updated chart will be posted after the close IF there are substantial development - i.e. a higher high is made. [x] If there should be a higher high, that high is likely either green #9 (which logically is [iii]-up, v of (v) of [iii] is an expanding EDT) or purple #11 (which logically is [v]-up, a contracting EDT). ES topping. Also see yesterday's EOD update for thoughts. No change to the big picture assessment discussed in Turn Window (2/17/12) and yesterday's EOD update. 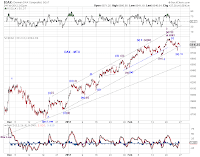 (1) a downward turn from a time perspective and (2) potential of further advance with little retrace from the perspective of cross market analysis. Based on the green count, the first two advances of the proposed EDT (i and iii of [iii]-up) took approximately the same amount of time to finish. Depending on where one marks the green iv-down of [iii]-up (see iv? 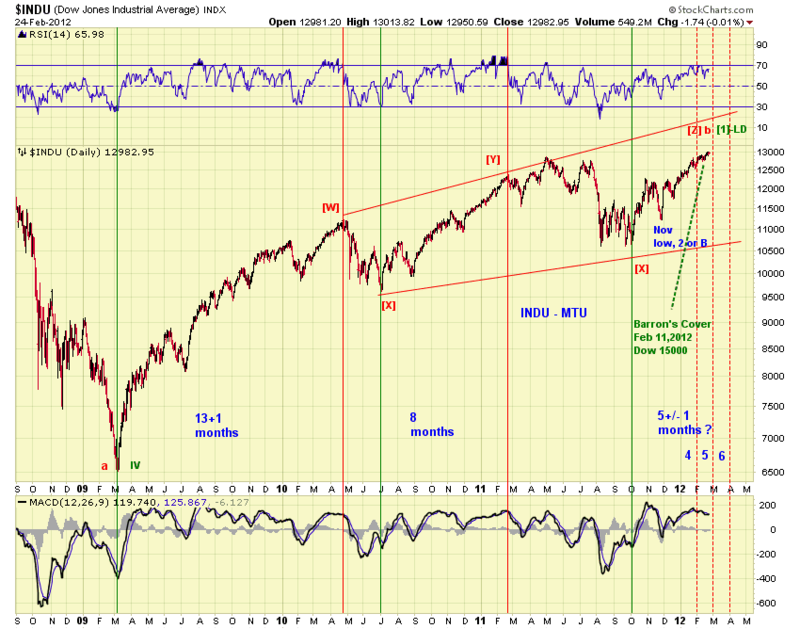 and iv), time equality points to a turn later this week or early next week. 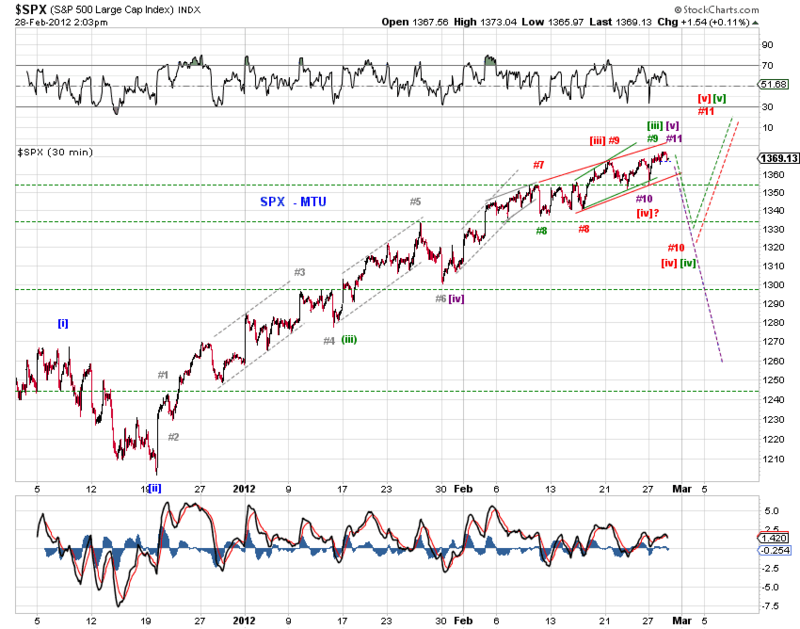 As mentioned in yesterday's EOD update, the upside is likely capped by 13150 in the Dow based on a contracting wedge. 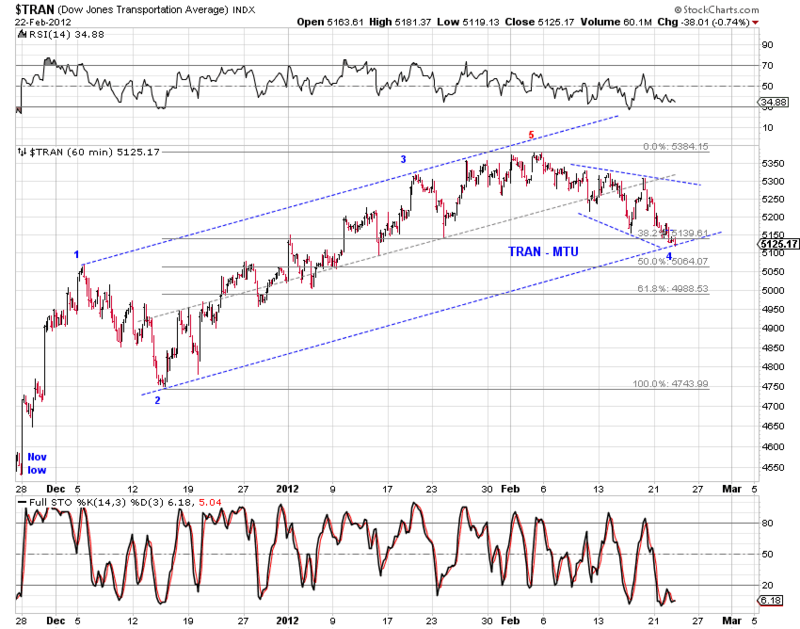 The concurrent divergence between the Transports and the Dow has been much discussed of late. 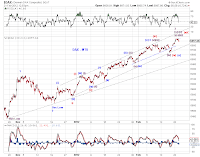 However, the count in Chart 2 on the Transports and the primary blue count of the Dow in Chart 1 would place them roughly in sync for a fifth wave advance from here. 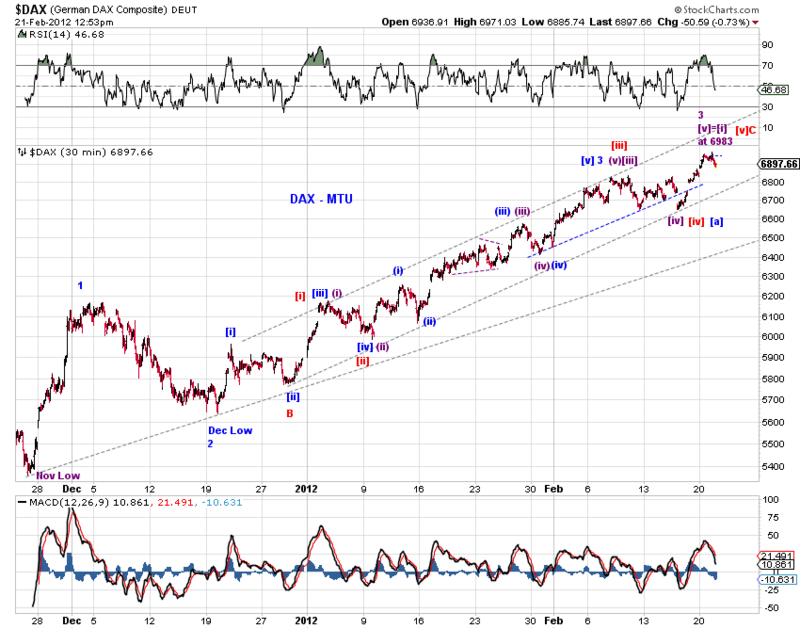 potential for a regular five from the recent low rather than a wedge. we'll find out. 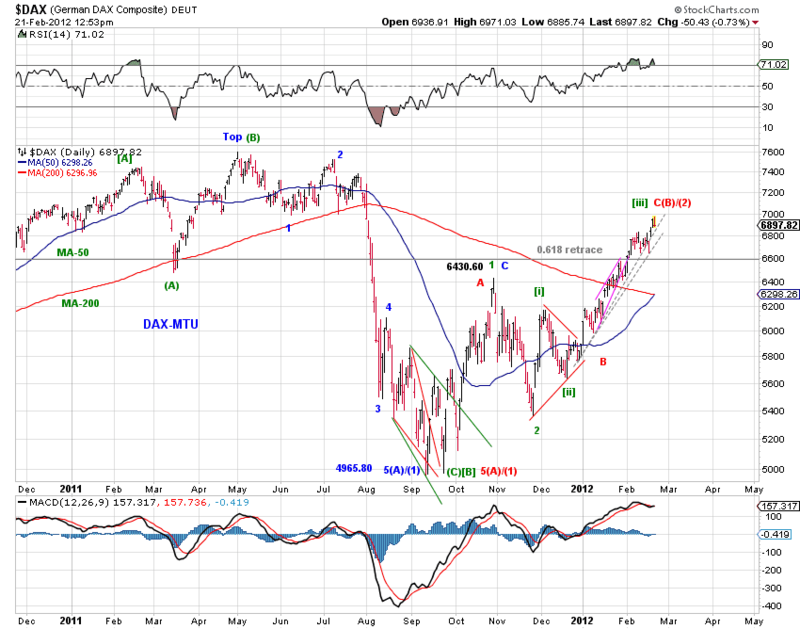 DAX and ES topping. 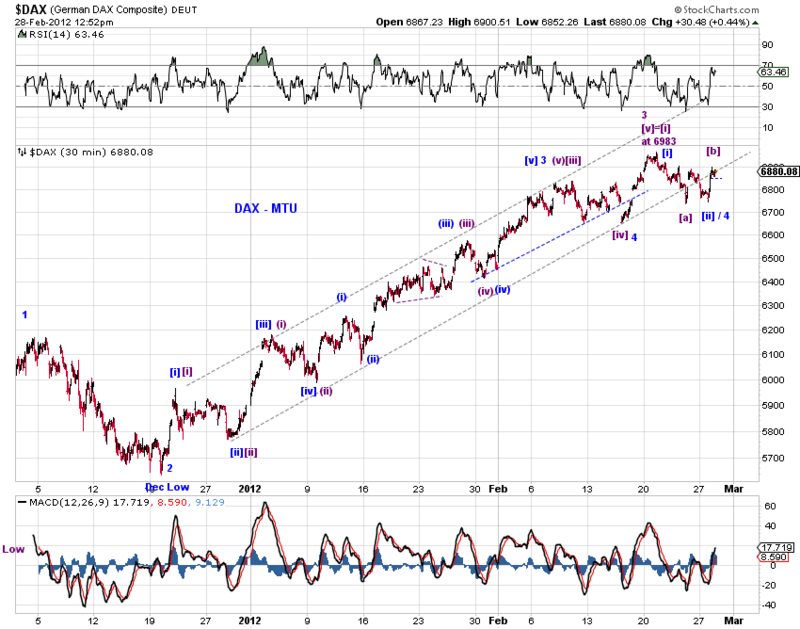 See yesterday's 710am entry for the larger counts and discussions on DAX (this chart). There's no change to the big picture assessment. See Turn Window (2/17/12) . Chart 1 refreshes the larger count. Squiggles from the Feb 15th low are fuzzy and lack confirmation. 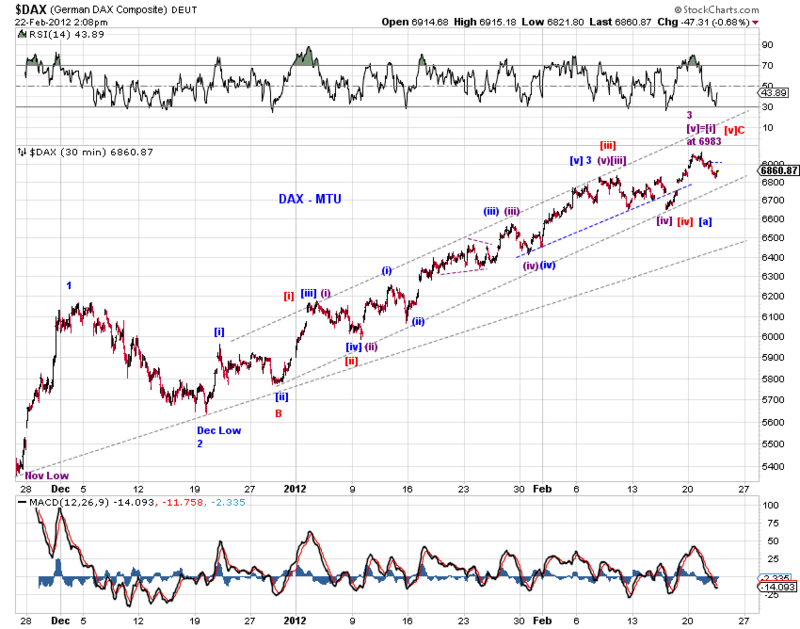 One can count a reasonable five wave advance from that low to today's high and it channels well. Thus, a top (i.e. red) could very well be in place. 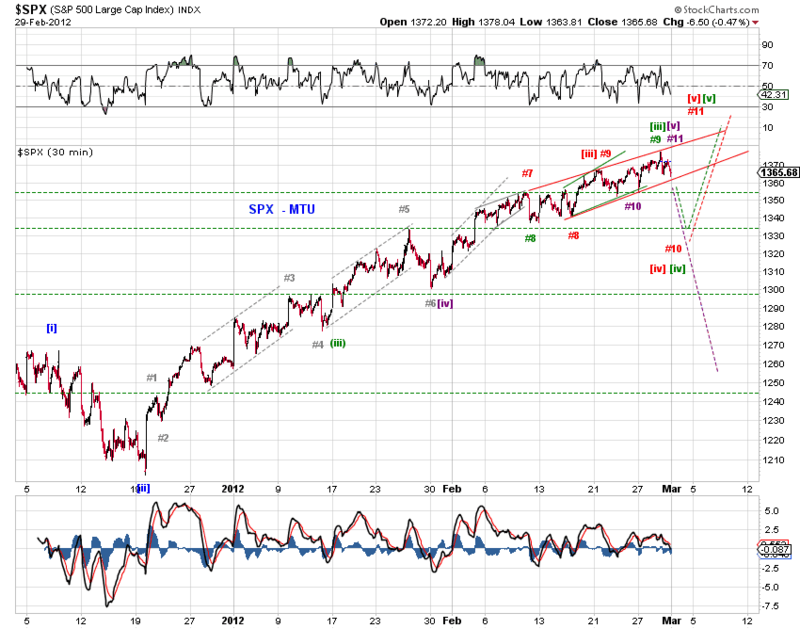 Alternatively, today's high could be wave (A) of wave [E] of a large wedge (i.e. 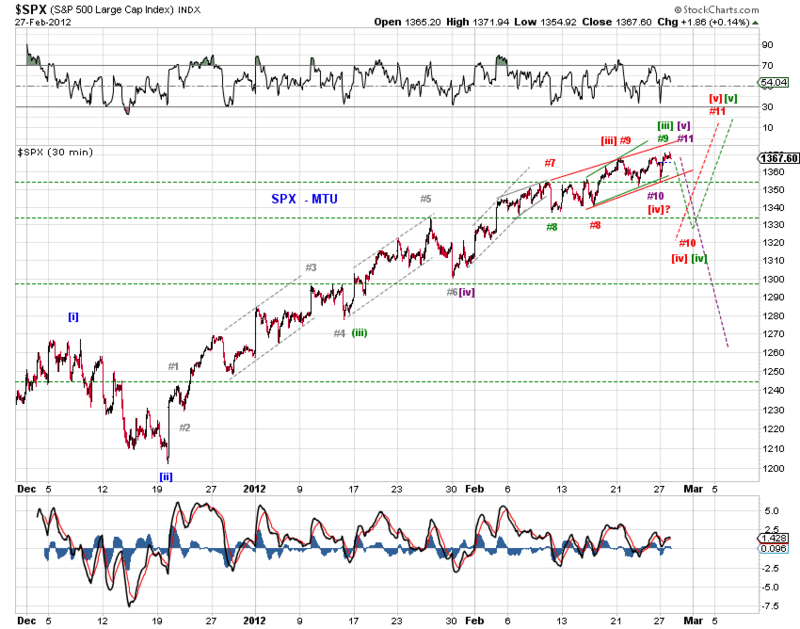 green) - if so, the upside is likely capped by 13150 in the Dow. ES topping. 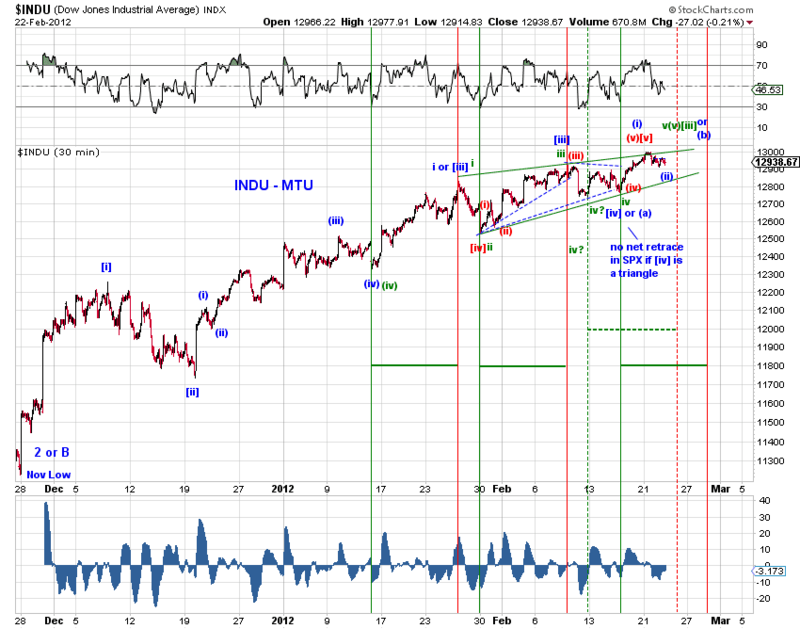 End of post Dec-low impulse (blue) barring endless extension (green). the green count (Chart1), which is the purple count in Chart 2. Note that the purple [v]=[i] at 6983 and the current high is 6971. These counts are roughly in sync with the top counts in INDU/SPX. See Turn Window (2/17/12) for details.